It is likely that many who set off from San Francisco for the great coastal redwood forests in the far north do not realise quite how far away they are. The national park is well over 300 miles distant, and the first redwood groves close to the main road are still almost four hours drive away, but at least the journey is interesting. Once over the Golden Gate Bridge, US 101 is known as the Redwood Highway, although there are few trees of any kind for the first 70 miles, which pass through near continuous suburbia. After Healdsburg this is replaced by agricultural land - vineyards, orchards and fields for another hour's driving, then for a similar time the road passes through regular pine woodland with scattered small farms and villages, and enters the long valley formed by the Eel River, which it follows all the way to the Pacific Ocean. 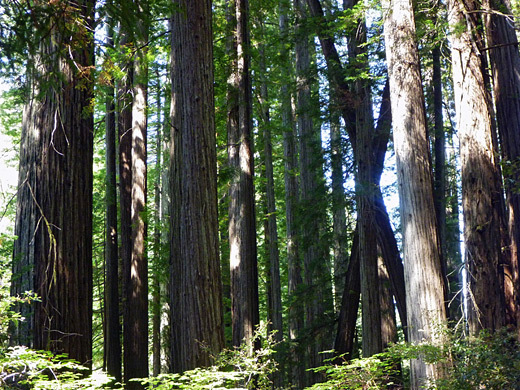 The trees become gradually but noticeably larger and finally the first pockets of redwoods appear. 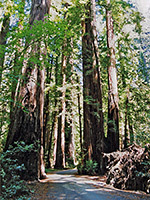 The first two recognised locations are Smithe Redwoods State Reserve and Richardson Grove State Park, but rather more impressive are the extensive forests of the Humboldt Redwoods State Park, a 52,000 acre region that is second in importance only to the even larger Redwood National Park, 88 miles further north. The state park begins 228 miles north of San Francisco and lies astride US 101, mostly on the west side. 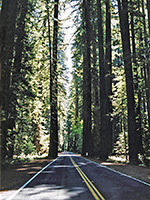 The main road passes many big trees, but the only way to properly appreciate the beauty of the forest is to drive the Avenue of the Giants, a narrow, much less travelled route that parallels US 101, about one mile away - far enough to escape the noise of traffic. It was built around 1880 as a stagecoach route, and has been popular with tourists ever since. The whole avenue is 32 miles long, starting a little south of Phillipsville and rejoining the highway at Stafford in the north, of which the central section is through the park and encounters the most impressive trees. 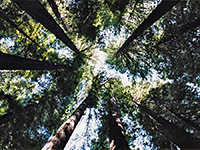 Over the years a fair amount of the original redwoods have been felled for timber, but about one third of the trees in the park are original, old-growth woodland on average 500 years old, sustained by the summer fogs and heavy rainfall that exceeds 50 inches each year. The surroundings are not entirely forested as the road runs through meadows and clearings, and not all the trees are redwoods - they grow in dense but short patches in which the silence and stillness seem noticeably more intense. This is certainly a place for hiking, if only for half an hour or so, to experience the true nature of the woods. The nearest major towns with hotels are Garberville to the south, or Fortuna and Eureka to the north. Many of the groves are named, and often narrow footpaths start at roadside then disappear tantalisingly into the dark forest. The avenue has plenty of parking places next to particular groups of trees, and a numbered auto tour identifies the most important locations. There are two campgrounds, various picnic areas and a large visitor center complex which includes a museum and bookstore. 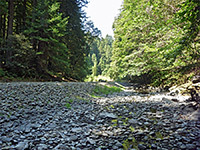 More about particular locations in the Humboldt Redwoods.